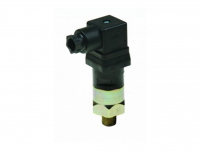 This versatile and robust general purpose pressure switch with snap action microswitches can be used in a wide range of hydraulic and pneumatic applications. Their proven piston/diaphragm design offers outstanding accuracy over a very wide pressure range with an outstanding 6000 psi proof pressure. Their modular construction allows us to offer a large number of standard pressure fittings in two materials as well as numerous electrical ratings and terminations. Users can easily configure this model to meet their needs.